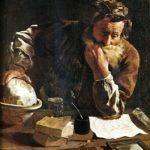 Archimedes was a Greek mathematician, physicist, engineer, inventor, and astronomer. Although few details of his life are known, he is regarded as one of the leading scientists in classical antiquity. Generally considered the greatest mathematician of antiquity and one of the greatest of all time, Archimedes anticipated modern calculus and analysis by applying concepts of infinitesimals and the method of exhaustion to derive and rigorously prove a range of geometrical theorems, including the area of a circle, the surface area and volume of a sphere, and the area under a parabola.